Since we have entered the Age of Resistance, it’s important to keep one’s protest muscles well-toned. With all the marching, kneeling, standing, sitting, walking out, gesturing, and pumping of hand-lettered placards up and down—not to mention furious typing on Twitter—ordinary citizenship in the United States now demands a higher level of physical fitness than we American couch potatoes are accustomed to. Moreover, it can be confusing trying to parse what all these exertions mean. If I hold three fingers in the air, does that mean I intend to join the Mockingjay and rebel against the Capital? Or that I’m not a fan of the Thai military coup? And does two arms in the air with hands turned down still mean “I disagree,” as it did during the Occupy sit-ins? Speaking of sit-ins, is sitting always a protest gesture? Or just outside important buildings? And what about the hokey-pokey? Is that an elaborate protest dance of some kind? It’s time for a review of basic protest semiotics. As every post-structuralist knows, signs are not inevitably connected to things; they are contextual, dynamic, and multivalent. And these days, protest gestures have become a complex language, complete with syntax and subordinate clauses. We need hermeneutical help. So here’s my attempt to sort out some of the more ambiguous gestures and to suggest a few new ones. I do this with (seriously) great respect for the importance and necessity of protest. Since you need to get your body involved to really understand, go ahead and stretch a bit, maybe jog around the living room to warm up. Breathe deeply now. Inhale, exhale. OK, ready? Here we go. When Colin Kaepernick and other NFL players started kneeling during the national anthem, though, things got complicated. They were trying to convey the following: “I protest police brutality, especially against African Americans. 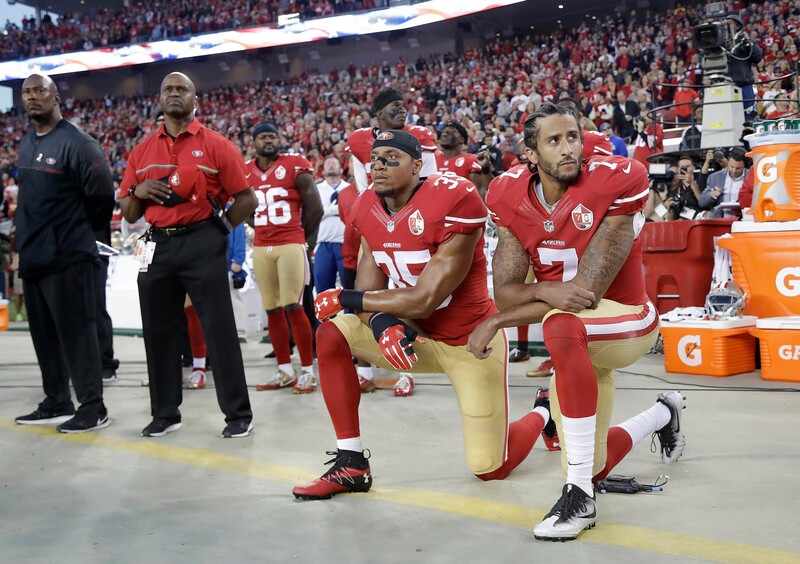 At the same time, I respect this country and those who have served in our military and therefore I am making this carefully considered gesture.” Since kneeling derives connotations of humility and respect from the aforementioned contexts, the players hoped their message would get across. As Rachel Held Evans pointed out, some varieties of Anabaptists, for religious reasons, do not pledge allegiance or sing the national anthem, and so far they are not under threat of deportation nor relegated to locker rooms. So maybe there’s a racial inflection to this NFL thing, what with 94% of NFL franchise owners and 75% of head coaches being white while 70% of players are black? Hmmm. Here’s an interesting (and unlikely) hypothetical: What would a Mennonite football player do? Not sure, but if you wish to protest the NFL’s decision, you might try this gesture during pro football games: place your thumb over the “off” button on your remote control. Press. Goodness, that’s a mouthful. See how much you can express with a purposeful trek to the door? Now that we’ve dealt with the basics, let’s tangle up our bodies in more challenging contortions, thus expanding our protest vocabulary. Here we need some help from the practice of yoga. Well, no doubt you can think of your own protest gestures to help expand our resistance vocabulary. Suggest ideas in the comments below. Meanwhile, remember to breathe.